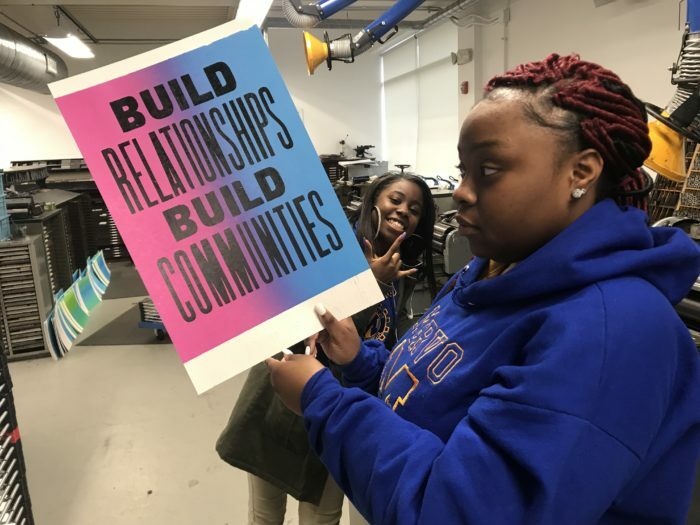 GLOBE COLLECTION PRESS: "BUILD RELATIONSHIPS, BUILD COMMUNITIES"
This week the Design Team created an informational poster about restorative practices. Restorative practices are when a group of people talk about the past, future, and share their feelings. It can be used in schools to build relationships and resolve conflicts. We want classrooms using this practice to have signage promoting their involvement. I joined in this project towards the end, but still learned a lot about the process. Before I became a part of this project, the team had already finalized the wording of the poster: Build Relationships, Build Communities. The next step was to prototype. 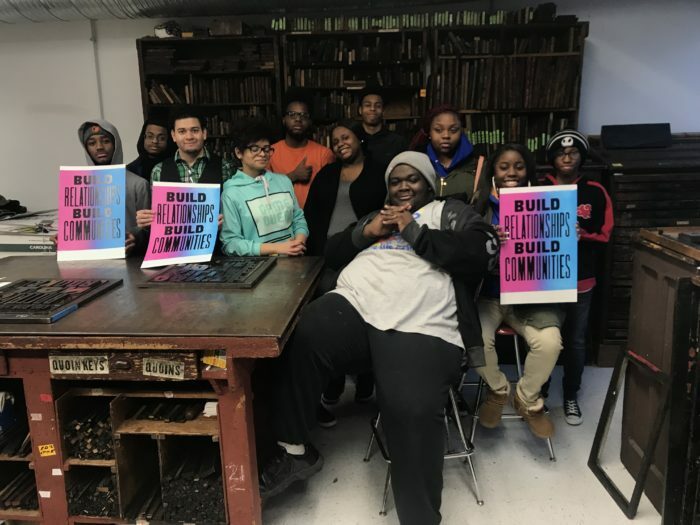 We created the poster by using letterpress technique. Letterpress is a very old way of printing. We were able to create the posters by going to Globe Collection Press at the Maryland Institute College Arts. I normally create posters on the computer software Adobe Photoshop, so having to create by hand was very new and fun. Using a letterpress machine isn’t as easy. When using a letterpress machine, you actually have to look for the letters.The typefaces are blocks with letters on them. There are metal blocks and wood blocks. We used the wood block since it’s lighter in weight. Just like photoshop, there are many different types of fonts you can choose from, but you have search for the right font and size that you are looking for. There is a lot measuring involved as well. Printing is restricted to the size of your letterpress machine. So we had to choose specific fonts and sizes that fit inside a form. You have to measure the letters and make sure your kerning, or spacing between letters, is correct. In retrospect, it’s kind of like using photoshop but the long way. The finished results looked great. The poster had a blue and pink gradient background and the wording was in bold type. I liked how the words were arranged and how the font looked on the poster. I liked the design because it was very simple. I wish to learn more about using different types of design.